I'll bet you don't -- even though you've heard him everywhere you've been in recent weeks. And next year, starting in November, you'll hear him again -- just like you did last year and each of the 45 years before that. You can't miss him, he's everywhere.... in the stores and malls.... in the dentist's office.... on the radio.... on TV.... everywhere. His name is Bobby Helms. Bobby is the person singing "Jingle Bell Rock". Year after year, it ranks as one of the Top 5 most performed Christmas recordings. 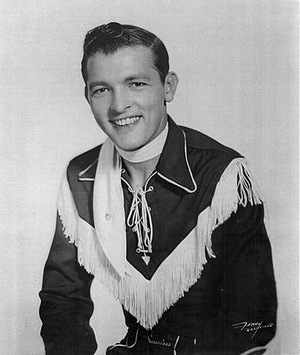 Bobby had a long career, first arriving in Nashville in the 1940's. He died in 1997 at his home in Indiana at the age of 63. But the year 1957 defined his career. That year, he had 3 records at the top of the charts -- "Fraulein", "My Special Angel" and "Jingle Bell Rock". Other than those 3 monster hits in 1957, I couldn't tell you another song he ever recorded. "Jingle Bell Rock" has become an amazing perennial hit. I've looked over several lists, ranking the most popular Christmas songs, and "Jingle Bell Rock" is always there near the top. In case you're wondering which holiday recording is Number One nationwide, that would be Nat King Cole's beautiful version of "The Christmas Song". But here in Nashville, the two songs I hear the most.... by far.... are "Rockin' Around the Christmas Tree" by Brenda Lee, and "Jingle Bell Rock" by Bobby Helms. Brenda's classic also shows up every year on every list of top Christmas songs. Hope you're rockin' around the holidays, and having a wonderful time.